The Sunshine Homes sign is coming along nicely. Today I sourced a 12″ x 12″ x 4″ waterproof electrical box to house the transformer for the low voltage LED wiring. It was fastened to the back of the sign frame. 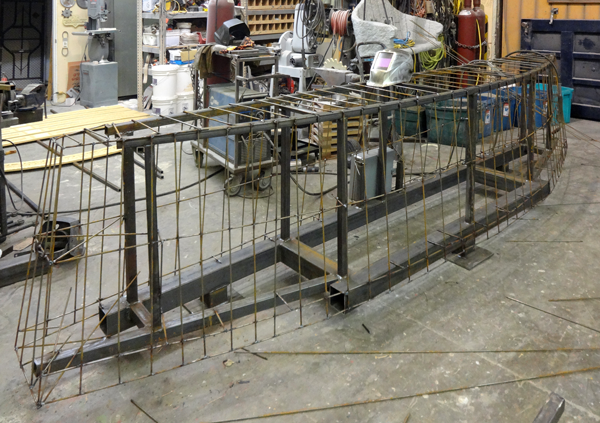 Then I started welding up the pencil rod frame to which we will attach the galvanized lath and then sculpt the fiberglass reinforced concrete rock work. I welded up a grid with the bars spaced about four inches apart – plenty strong for this project. It is all braced back to the heavy structural frame. It is my hope that I will be able to create the routing files for the lettering tomorrow. Then I’ll glue them up over some heavy rods which will permanently hold them in place on top of the sign.